Do not fear brown eyeshadow! It’s actually one of the more wearable shades out there no matter what your eye colour is. Plus, it blends beautifully to make daytime smokey eye looks. This luxe box of truffle-inspired shades features six shadows; from creamy champagne to sparkly taupe to a rich dark chocolate that doubles as an eyeliner. Your sister would love to unwrap this sweet box on her birthday! The ultimate gift for the ultimate hostess in your group; this miniature chocolate fondue fountain will give any brunch spread or holiday open house a gourmand feel. Simply place some fresh fruit or cookies nearby and watch as your guests indulge in this yummy, special treat. Even if you only haul it out a few times a year, the price tag makes this an affordable indulgence. The original movie adaptation of Roald Dahl’s classic morality tale is amongst my favourite movies of all time. Between Gene Wilder’s stunning performance and the 1970s eerie factor, it’s a treat to watch from start-to-finish. Mega fans of the film can indulge in this insane Blu-Ray collector’s edition of the film, which includes nearly 200 hours of content and tons of fun extras (including a chocolate-scented eraser and Snozberry-scented pencil). Whoever heard of a snozberry? If the only way you or a little one can stomach a glass of milk is by adding a spoonful of chocolate syrup or powder, this mug may be a worthwhile investment. 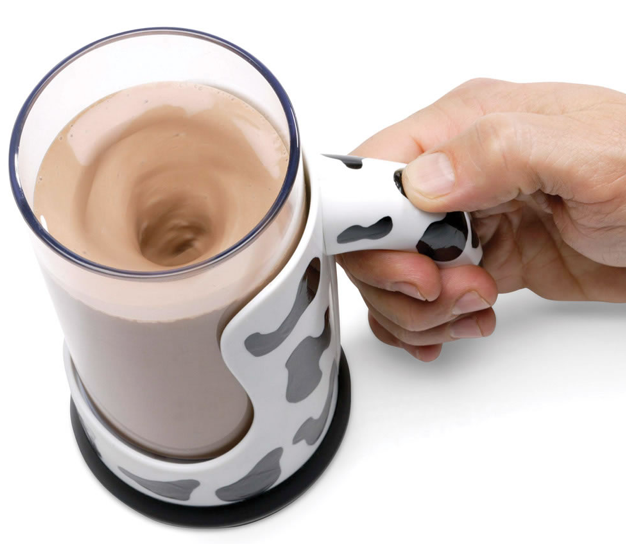 The gist of this miracle mug is you place a glass inside of a cow-themed holder with a trigger button that efficiently and tidily stirs up your magical milk potion. No mess. No chocolate residue on the bottom of the glass. Plenty of smiles. Just hearing the section titles for this ooey, gooey, finger-licking chocolate-themed cookbook from the Canadian Living kitchen goddesses has me salivating. With over 100 decadent photos, the book features scrumptious recipes under such classifications as “Melty” (truffles, candies and bars, like Earl Grey Truffles) through to “Chilly” (frozen treats, like Mini Baked Alaskas). And, not to overstate the obvious, knowing that it comes out of Canadian Living’s rigorous test kitchens, you know these goodies are going to be better than good. A wonderful choice for anyone from your friendly foodie to your sibling that’s constantly churning out bake sale goods and could use some fun updates. 1) Tell me in the comments below by October 21st: what is your favourite chocolate dish? And hey, pure, unadulterated love of a simple milk chocolate bar is a-ok. Also, tell me what your favourite featured chocolate-y item is! 2) Entries are limited to one per person / per email address / per household (or more if you score bonus entries). A random draw will be conducted on or around October 22nd to select the winner, who will have 48 hours to respond before another winner is chosen in their place. 4) Bonus Entry: Follow me on Twitter and tweet about this giveaway two times over the contest period to score yourself two bonus entries. Make sure you tag me! I have a cream cheese double chocolate brownie recipe that is heavenly – my favourite! I have a great recipe for chewy, soft chocolate chip cookies. my favourite chocolate dish are brownies. I could eat a whole batch myself! I’d feel really bad afterwards but as it was going down it would be soooo good! Chocolate Brownies…or a chocolate bar…but it has to be from the UK! My favourite chocolate dish is chocolate mousse. 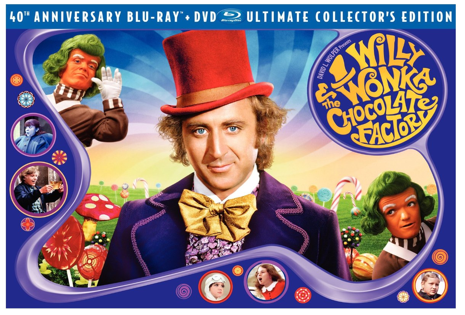 And my favourite chocolate-y item is the low-cal Willy Wonka and the Chocolate Factory Ultimate Collector’s Edition. Now that’s a classic, must-own movie! Favourite is such a difficult word — I’ve got a Chocolate Cointreau layer cake recipe that’s amazing for now I’ll call my favourite. 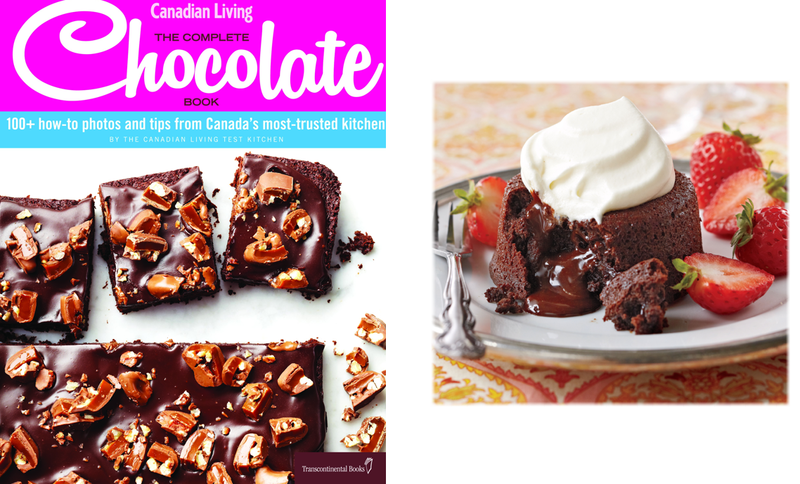 My favourite chocolate-y item featured above is the “Canadian Living: The Complete Chocolate Book” since these great cookbooks are as fun to read as to cook from. My favourite is a a Dark Chocolate Bar – I would love to have the Nostalgia Electrics Fondue Fountain; it would be a great idea for special dinners. I love my mom’s chocolate cake with chocolate icing! 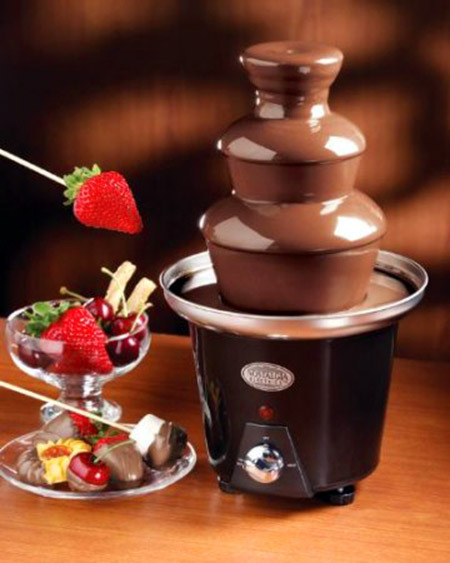 My favourite idea today is the chocolate fondue fountain. My favourite is chocolate lava cake and featured item is the book. I love Purdy’s Sweet Georgia Brown chocolates, anything that has a combination of chocolate, nuts and caramel is A-Okay by me! My favourite chocolate-y item is the Bobbi Brown Rich Chocolate Eye Pallet. My favourite chocolate item is probably a KitKat bar! My favourite from this post is the eyeshadow palette! I love “Compost Cookies” inspired by Christine Tossi from Momofuku. Shhh, I make them with chocolates I steal from the bounty the kiddies bring in on Halloween. I really, really like espresso brownies, rich chocolate brownies with a chocolate espresso ganache. My favourite chocolate dish is chocolate brownies. Love the Bobbi Brown Rich Chocolate Eye Palette from Sephora featured above! My go to favorite choc dish would be when I make choc fudge molten cake! YUMMY… and I love the Bobbi Brown Rich Chocolate Eye Palette at Sephora it just say CHOCOLATE! I’m really in the mood for chocolate fondue right now, at the very least… some kind of chocolate sauce that I can dip some fruit in. My favourite is chocolate cake with icing! chocolate coated strawberries and grapes are the favorites in our home! My favourite chocolate is pretty much anything dark but at the top of my list is rich brownies with dark chocolate chips and expresso powder missed in. Canadian Living Chocolate Cookbook would be my pick. My favorite chocolate dish is brownies with thick cover of icing heated with a scoop of vanilla ice cream topped with whipped cream. My favorite featured chocolate item is the electric fondue fountain. We make our own milk chocolate sponge toffee nuggets just like the real “crunchie” bar. Delish! my bf makes a flourless chocolate cake, It is soooo good! I also love chocolate truffles! My mom makes the best chocolate drop cookies yum! My favourite chocolate dish is a chocolate hazelnut mousse. I love desserts that are light in texture with the added pleasure of the chocolate. I like a good quality semi-sweet chocolate bar and love Willy Wonka! I love chocolate cake, with a really good chocolate icing. My son would love the mug with the mixer, because he says only I can get the powder mixed up right. I would love the Canadian Living book. Chocolate peanut butter cups – who can resist PB and chocolate?! love just about anything chocolate – the darker the better. a bitter chocolate almond mousse is glorious. thanks. Favourite item in above listings: Hammacher-Schlemmer Messless Milk Mixing Mug — Hammacher-Schemmler always has some fun, off-beat items in their catalogues. My favourite chocolate dish are my over-the-top brownies! second tweet sent today. https://twitter.com/leeper5p/status/392306439873523712. thanks. my mom makes the most devilishly wonderful chocolate cheesecake. My favorite chocolate dish is bananas dipped in chocolate (yum). The item that I prefer on your list is the chocolate fountain.